How Hormones Influence Our Bodies—The Secret To Our Moms’ Weight Loss Success! I think we all can agree, every women’s body is unique, especially when it comes to storing and losing body fat. As moms our hormones have been on a wild roller coaster ride of ups and downs—pregnancy, birth, nursing—and then we *think* we have our own body back after our little one is no longer dependent on our breast milk. Wrong. The post-baby body is a whole different vessel. Do you agree? Hips & thighs feel a wee bit wider, maybe you have back fat that you never had before, and your abs…does that skin ever shrink around your mid-section? Your post-baby body is a result of creating a beautiful baby, or two or three, AND most likely a victim of unbalanced hormones. I’ve come to learn through my own experiences and working with a nutritionist that hormones can wreak havoc on mom’s body—from insomnia, depression, mood swings, irregular periods, to fat storage in undesirable areas. Enter Active Moms’ Club brand new fitness and nutrition program—60 Days of YOU! 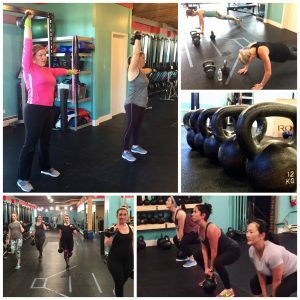 In September we launched this unique program that focuses on mom’s self care—connecting mind and body through fitness and nutrition. Many women, especially moms, tend to be estrogen dominant. Estrogen dominance is when women have too much estrogen compared to progesterone. Not only does estrogen dominance lead to mood swings and irregular periods, it often leads to fat gain due to how it can trigger a cascade of hormonal changes involved in metabolic rate. On the fitness side of AMC’s 60-Days of YOU! program, our exercise mode of choice is resistance and weight training. 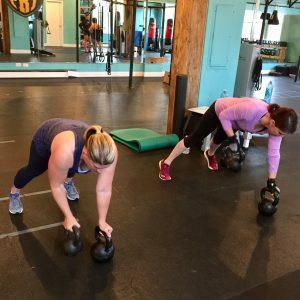 Each mom participates in 1-3 Fit & Fab Small Group Training sessions each week. Our Fit & Fab sessions incorporate weights which helps build lean muscle mass, while increasing growth hormone levels that help with fat burning. Cardio alone as an exercise modality will not yield the fat loss that we all desire. Moms need to lift heavy weights to torch body fat. With the support of two coaches we’ve taken the guesswork out of slimming down, getting fit, and establishing a healthy relationship with food and exercise. We are exactly half-way through our inaugural 60-Days of YOU! program and our 25 moms are SEEING and FEELING a huge difference in their bodies! The program is wildly successful! Most women in the program have lost an AVERAGE of 5 pounds; three moms have lost 10 pounds since September 16th! 10 pounds in 30 days! They are learning a new way to eat and exercise. I feel way more energized today than I did 30 days ago! I love how my clothes are fitting better. I was really exhausted and stressed out last night and really wanted sugar but then I remembered how great/energized I’ve been feeling the last two weeks, and I refrained from giving in! Since the program has started, I’ve lost about 8 pounds! 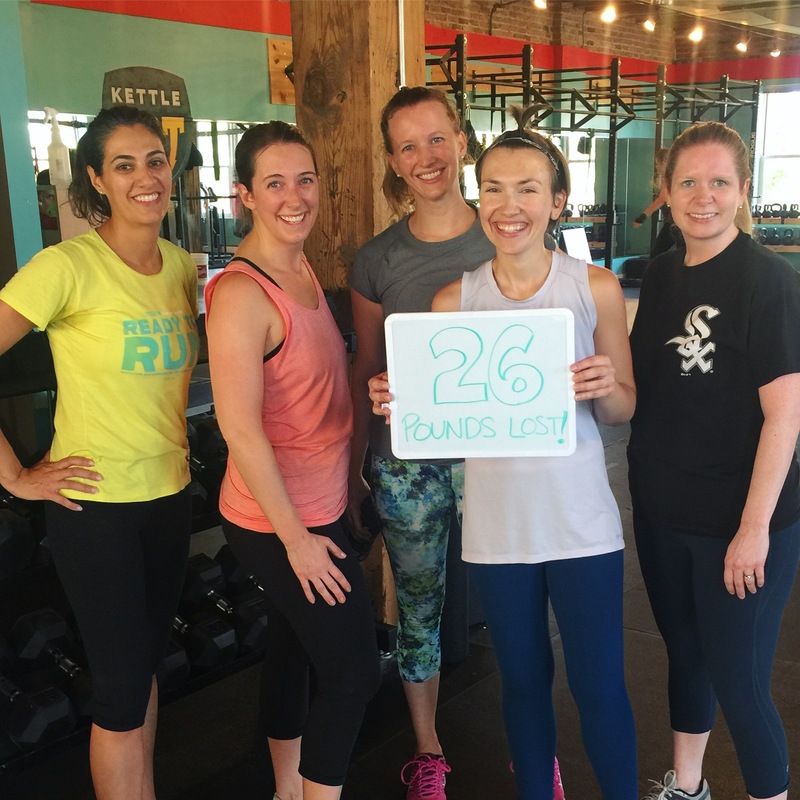 Combined, these women have lost a total of 26 pounds in 22 days! We want to help more moms find the best version of themselves, 60-Days of YOU! program returns January 2018. Let AMC help you be a slimmer, healthier, fitter version of yourself! You have all the right things to gain.